I'm sharing a cozy tea with my late Great Aunt Kitty's trio set that she painted for me, of which I have six different designs. She painted these as a shower gift for me. Since violets are for the month of February, I'm using these pretty pieces on such a rainy, dreary day that we are having. Isn't this a pretty teacup? My Aunt Kitty had no children of her own, and my grandmother, who was Aunt Kitty's sister, and my mom's mother, died when I was probably three or four years old, and my Aunt took the place of my grandma. Here's my baking partner, who just so happened to lick the marshmallow creme spoon, when she finished spreading it on top of the brownies. That girl is so fun and she keeps me laughing!! These are so heavenly, and a great recipe for kids to make. My son thinks they taste like a buckeye with cream. Prepare, bake and cool brownie mix according to package directions for 13 x 9-inch baking pan. Evenly drop marshmallow creme onto cooled brownies with spoon. Microwave frosting in small microwave-safe bowl at HIGH 30 seconds or until melted and smooth. Repeat with peanut butter. Pour melted frosting, then melted peanut butter over marshmallow creme and swirl with butter knife to marble. Let cool completely on wire rack. To serve, cut into squares. Your Aunt was a great artist, I love the teacup trio, I also love Violets. I have never been able to grow them. Those brownies look so good, time with grandchildren is Time well spent. OH my, a brownie that has everything! Your tea set is so pretty, I wish I could ask her what her technique was for painting the fine china...I know you've mentioned it before, what treasures to have from your family! Cissy is such a doll, my grands aren't too interested in cooking but they do love to draw and paint! Your Aunt Kitty sounds like a sweet lady and she left you with a name and those beautiful springy tea cups. I just realized how much your darling granddaughter looks like you by looking back in your blog and finding a photo of you when dating her grandfather. Yes, so much alike! Connie, your Aunt Kitty sounds like a treasure and her handiwork is beautiful. I can't imagine painting on china. The colors are so delicate! Your granddaughter looks so happy. Yum! 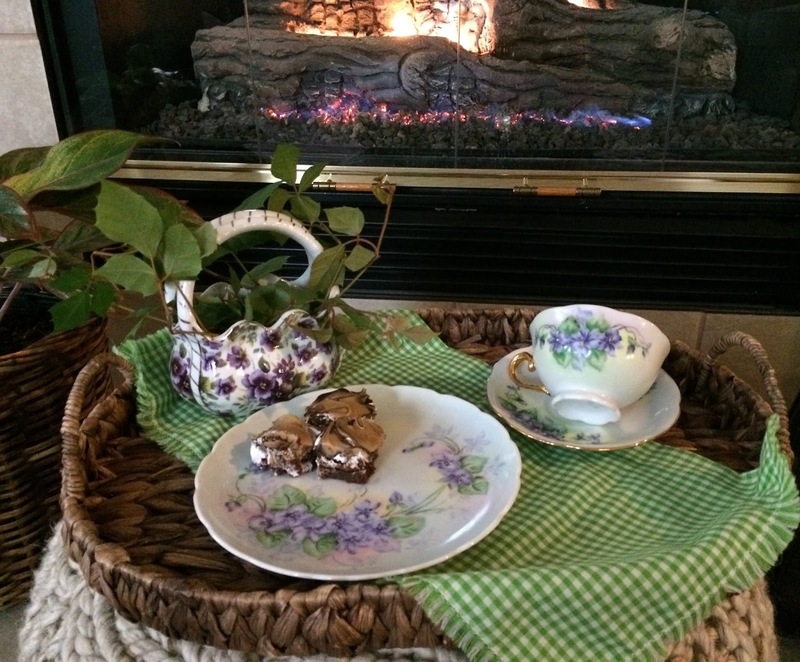 Your teacup Trio is so pretty and dainty!Love the wonderful brownie too,it looks delicious.Hugs to you and Cissy! The handpainted trio set by your Aunt Kitty is exquisite! I don't think I've ever had marshmallow cream. The chocolate/marshmallow/peanut butter looks like a divine combo. Good Lord Woman!! Are you trying to kill me??? These look SO SO SO good and I like that they are quick to put together. Ummmm . . . adding this to my "how to grow those hips" recipe stash. Now, onto those cups and saucers. Wow - I can't imagine the time and talent it took to paint those. They certainly are a treasure! Thanks for sharing the recipe AND the lovely cups! Talk about a cherished treasure, Kitty! Those 3 pieces of your tea trio are gorgeous! I just love violets, and those colors are still so rich. I can tell you've taken great care with them. The brownies sure do look good too! Tell Cissie she was busted! Have a great week. Well, your great Aunt Kitty was certainly a wonderfully talented lady...her painting is exquisite! What very precious treasures those beauties must be to you! The brownies look beyond rich and delicious! The brownies look and sound amazing! Love the pictures! We had a cold cloudy day two days ago, and now its getting a little warmer. Your helper looks like she is having a blast! I love that china and tea cup Kitty. Oh it must be so much fun you and Cissy baking together. I love those how yummy those brownies look. Thanks for sharing this at our Cooking and Crafting with J & J.
Oh my goodness! Those look delicious! And obviosly the chef thought so too! What a treasure that teacup is! What a talented lady! Thanks so muh for linking to Yuesday Cuppa Tea! Dear Kitty: What a perfect February post and lovely violet time. Those brownies sure look delicious and as always your sweet Granddaughter is once again becoming the Bakery Chef - so cute! Thanks for sharing and enjoy your week. Oh, my! These look wonderful! That dear grand-girl is just adorable, and I know you must enjoy her so much! God bless you, sweet friend. Continuing to pray for you every day! Oh, what special tea cups. Does anyone do "china painting" anymore? My mother gave me pieces that friends had done. Not an easy thing I suspect. Love seeing that you have a fire going. Here too! Kitty, those teacups are a real treasure! What an amazingly talented person your great Aunt was. 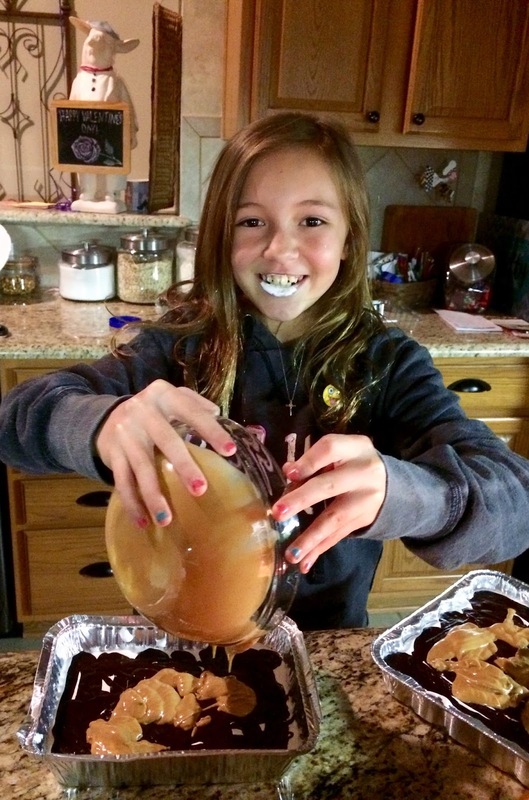 The brownies look so yummy and your helper is ever so cute with her marshmallow lips! Kitty, Cissy is so adorable! I was thinking, though, don't these need a sprinkling of graham cracker crumbs (only because of the s'mores name)? Those teacups are really beautiful. I know lots of women got into china painting during a certain era, but you rarely see such beautiful work as your aunt's. What a treasure of a trio, Kitty. The violets are so beautiful and amazingly painted by your Great Aunt Kitty. How precious that these pretties were painted especially for you. The brownies look deliciously gooey. I know I have said it ad nauseum......your Cissy is the sweetest young lady. Your little chef is just the cutest! I love that she wants to learn to cook and tasting as we go is the reward of cooking isn't it! Makes me want a brownie for breakfast! Thanks for sharing your sweet tea set and that lovely baking assistant of yours. 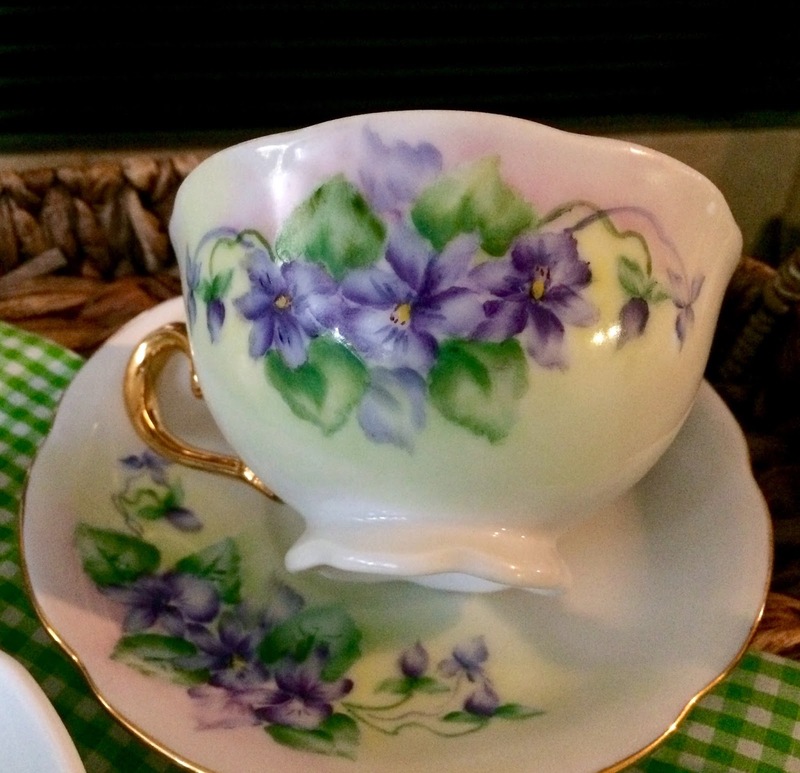 What a beautiful teacup, it sure reminds me of spring. 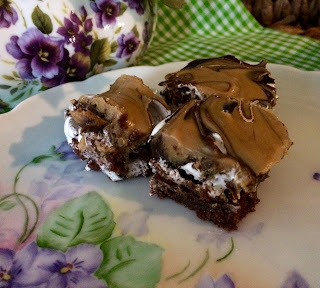 Your Gooey Peanut Butter Smore Brownies look like a hit with your Grand, and I think they will be a hit here at the cottage! Thanks so much for sharing your awesome post with us at Full Plate Thursday. Have a great week and come back soon! I love the story about Aunt Kitty. Your helper in the kitchen is a darling. I know you have just tons of fun. Thanks for sharing your recipe at Keep In Touch.